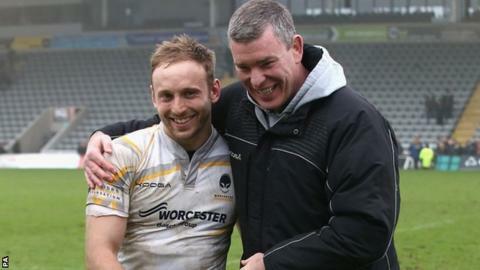 Chris Pennell will captain Worcester on Sunday when Dean Ryan's relegated side launch their mission to get back to the Premiership at the first attempt against Bristol at Ashton Gate. South African GJ Van Velze has been appointed captain for the season. But he is unavailable for the trip to Bristol - and vice-captain Pennell will instead lead out the team. It will be Pennell's first competitive appearance since his England debut on this summer's tour of New Zealand. Keeping hold of loyal one-club man Pennell, who signed a three-year contract extension last December, was crucial to Warriors' hopes of bouncing back to the top flight at the second attempt - just as they did after their last relegation in 2010. But blending in 17 new signings (seven of whom have been picked to make their debut in Sunday's starting line-up) has been another important factor in a pre-season programme that has lasted the best part of two months. "Our three pre-season matches were full on," Ryan told BBC Hereford & Worcester. "We deliberately wanted to start at a really high level so that we could reference that across the year. "We understand that we'll be facing different challenges every week in terms of the nature of the competition and the group we've got together but we're really excited about getting started. "We're going to get into this season and enjoy it. We will challenge ourselves to get better in it and to really understanding what the Championship is." For a league that has been billed by some as Worcester, Bristol and the rest, it is intriguing that the two pre-season favourites should be asked to face each other on the first weekend. But Ryan is already pointing out that there are nine months to go yet. "Both us and Bristol will want to get off to a great start on Sunday," he said. "We'd be a lot happier if we could get a win in the back pocket going into Monday morning. "But success in the Championship is about being successful in the play-offs." Replacements: Annett, Daniels, Scotland-Williamson, de Carpentier, Mulchrone, Eden, Stelling.